“We are honored to be recognized for our excellent communication, flexibility and commitment with these outstanding awards for a second consecutive year, and we appreciate the Dollar General team, whose consistent efforts make our partnership a success,” said President and Chief Executive Officer Derek Leathers. 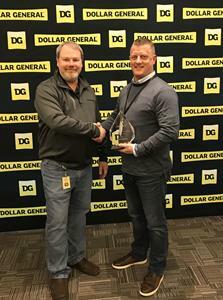 Dollar General selected Werner for Dedicated Carrier Partner of the Year based on utilization, communication, on-time service and the best partnership throughout 2018. Werner’s Fulton, Missouri, team was recognized as Dollar General’s Site of the Year for exemplary service by the carrier teams and distribution operations. Werner’s Dedicated Logistics Manager John Merritt received the Serving Others Award for his out-of-the-box thinking and recovery efforts during multiple winter storms.